Written, performed, arranged, produced and mixed at Wumpscutstudios 1993 in LA. This CD was released with two different inlaycards. VUZ edition only is the first one ; when VUZ Records was distributed by Subtronic Records a new inlaycard was printed, besides that both versions are identical. It also received a Subtronic Records catalogue number (Music For A Slaughtering Tribe) without being released on this label. I got this on tape from a friend back in 1995. Soylent Green blew me away back then because of the samples from the movie. The tape was it for me with :W: 'til about end of 2011 when I became a :W: fan! This album really defines the genre ENDZEIT ELECTRONICS. And nowadays Concrete Rage is my favorite from this album. Still got the selfmade cover from that tape! One of only four or five Wumpscut releases that are essential to any industrialist's collection, MFAST represents the range that should be present in any such release - from harsh beats to atmospheric dark ambient. 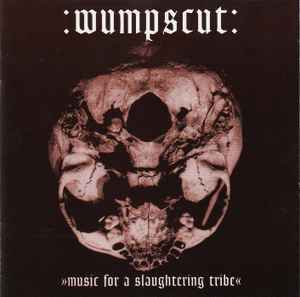 And compared to newer Wumpscut releases (best to pretend they don't really exist), this one contains a truly dark ethos, with just about zero 'hokeyness' (I said 'just about'...the beginning of "Default" is a little dumb). The best part about MFAST? When you're 30, you realize all the songs you liked when you were 15 are the worst ones, and all the tracks you skipped at that age are actually the best ones. But even the (comparatively) bad ones are still pretty damn good. That is, of course, if you bypass all the remix nonsense that appears on later editions. Also recommended: Dried Blood, Gomorra, Bunkertor 7, and Embryodead. Do yourself a favor and stop there.